In spite of its ancient origins, only in recent years have composers become interested in the Cimbalom. Beyond its typical timbre, one of the main reasons for such interest has been the great appeal of György Kurtág's music. Kurtág has displayed his love for this instrument, using it in many of his works. The Cimbalom's ancestors date back to the middle ages. The qânun, an instrument from the Islamic world, was made with gut strings, hit by a pick, and was the immediate predecessor of the Psaltery. The Psaltery, quoted in the bible, most likely arrived in Europe during the 11th century. A first portrayal of the Psaltery can be found on the portal of the church of Santiago de Compostela (1184). The Psaltery vastly spread across many countries, coming in touch with new cultural environments. This resulted in cultural modifications to the traditional instrument. New instruments originated, all of which differed in sound, but were similar in their constructive concept. In Greece, Turkey and Persia, the santur originated, in Russia the gusli, in Germany the Hackbrett, and in Hungary the cimbalom (some instruments were plucked, others were hit, and in some cases, including Italy, they were both plucked and hit). During the 18th Century, the Cimbalom became a constant member of gypsy orchestras, giving them an unmistakable color. In the following century, it reached the status of concert instrument, thanks to Ferenc Erkel and Franz Liszt. The Cimbalom's development was a result of some innovations, invented by the Hungarian instrument builder Vencel Jozséf Schunda: legs, and a damper pedal, were added to the instrument. These innovations were introduced to the audience during an exposition in Kecskemét in 1872. The Modern Cimbalom has 133 strings and a range of almost five octaves. It is usually played with wooden mallets, covered in cotton, metal or leather. Since 1897, Cimbalom has been taught at the Budapest Musical Academy. The first non-Hungarian composers who exploited the typical sound of the cimbalom were Debussy and Stravinsky. Among composers of today, we can mention Boulez, Dutilleux, Eötvös, Fedele, Ferneyhough, Francesconi, Gervasoni, Harvey, Kagel, Solbiati and Stockhausen. 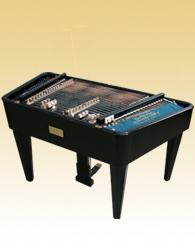 The original cimbalom instrument, modelled in Pianoteq, belongs to the famous cimbalom artist Luigi Gaggero and was built in 2007 by Balázs Kovács, Opera Zongoraterem, Budapest.